Choose from standing, table seated or bar seated tickets, and watch the action on Hard Rock Cafe’s screens. 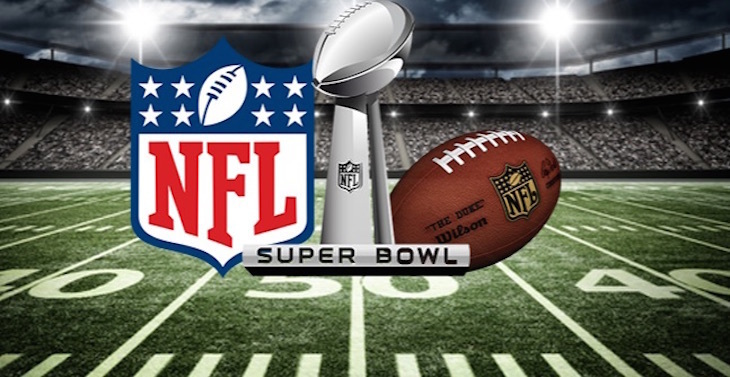 The restaurant’s full menu is available until midnight, after which fuel comes courtesy of the Big Game menu As well as food and drink, expect competitions, prizes, and a performance from the Big Game Cheerleaders to get you hyped. 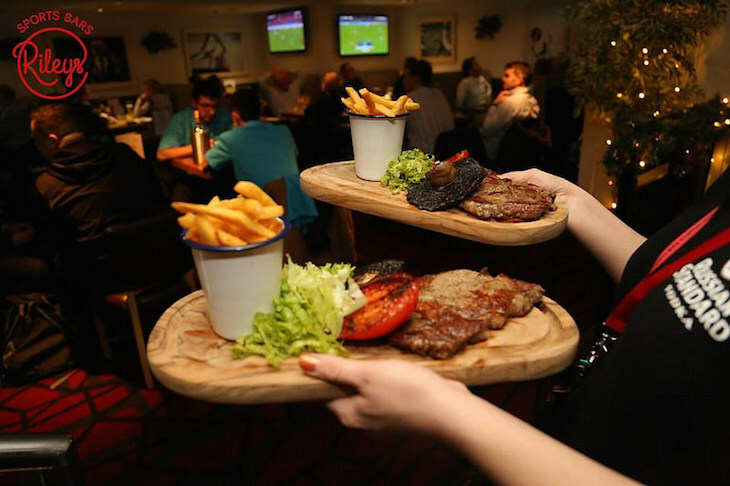 From £14.95, book ahead, 10pm-5am. 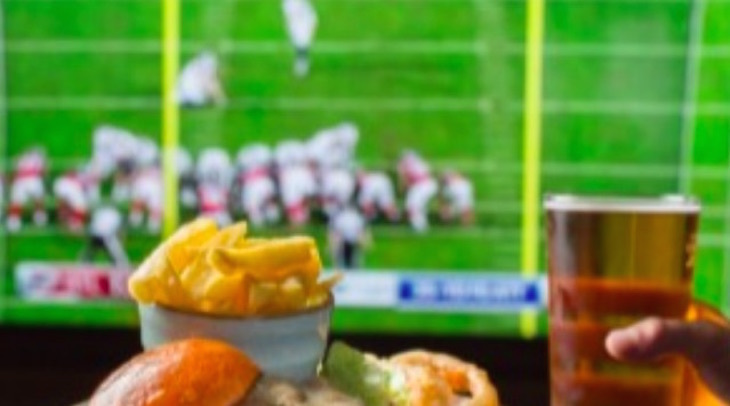 This US-style bar in the centre of Covent Garden shows the game across a total of 13 sizeable screens, with a special Super Bowl food menu available all night including burgers and sharing platters plus specially-imported American craft lagers. Buy a Combo ticket for queue jump admission until 11pm, plus a beer and hot dog included. Be aware that a ticket doesn’t necessarily guarantee a seat — you’ll need to book a table or booth separately for that, and a minimum spend applies. 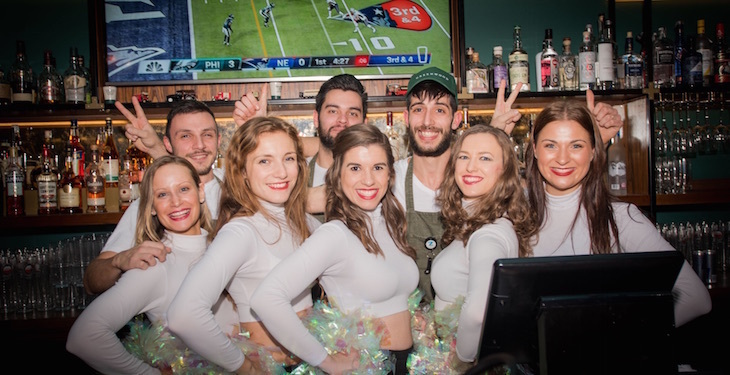 This Clapham pub claims to host London’s biggest Super Bowl screening, and we have no reason to doubt the claim. There’s a giant 25ft screen, plus eight smaller screens, and private boxes are available for hire. Ticket options cover a plethora of standing and seated positions, American-style stadium snacks are available throughout the game, and DJs and a cheerleading squad provide the pre and post-match entertainment. This sports bar and restaurant boasts 19 screens — including a central mega screen — showing the game, plus pre-game cheerleading performances, and DJs keeping the party going after the match. Your ticket only guarantees you entry until 9pm, and doesn’t guarantee seating. 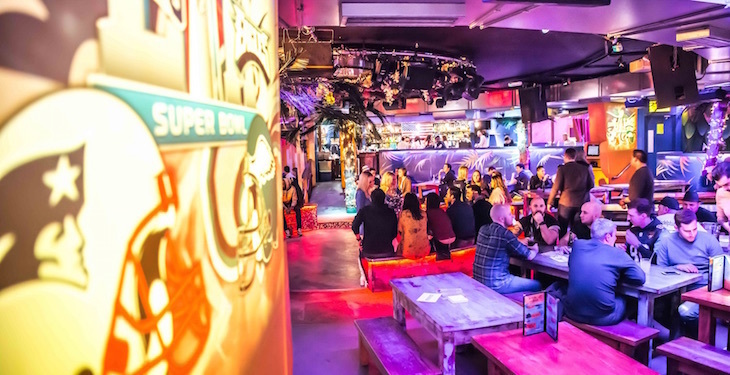 One of London’s most central sports bars, Rileys on Haymarket offers various standing and seated ticket options. If you’re willing to splash the cash, it’s £100 for seating in the VIP room with a bucket of beer and platter of food. Otherwise, a tenner gets you in. 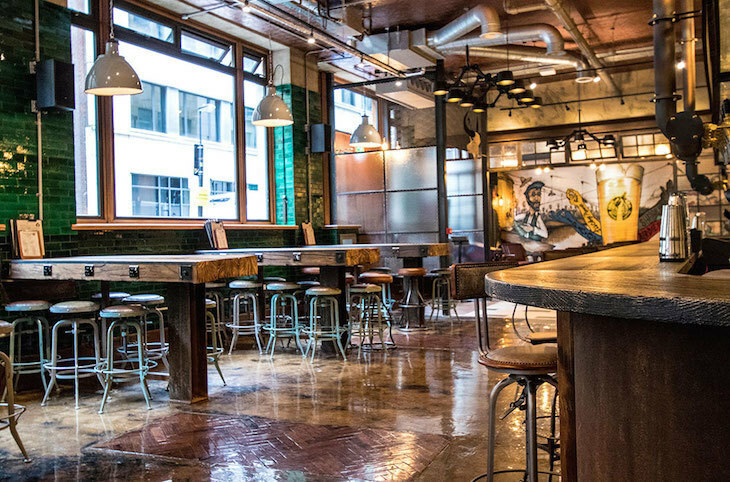 BBQ restaurant Bodeans screens the game at its smokehouses in Soho, Clapham, Fulham, Tower Hill, Balham, Covent Garden and Old Street. You need to fill in an online form to book, and your £30 gets you a complimentary beer, a starter served before kick-off, and a main course served at half time, plus nachos and wings throughout. £30, book ahead, from 10pm. 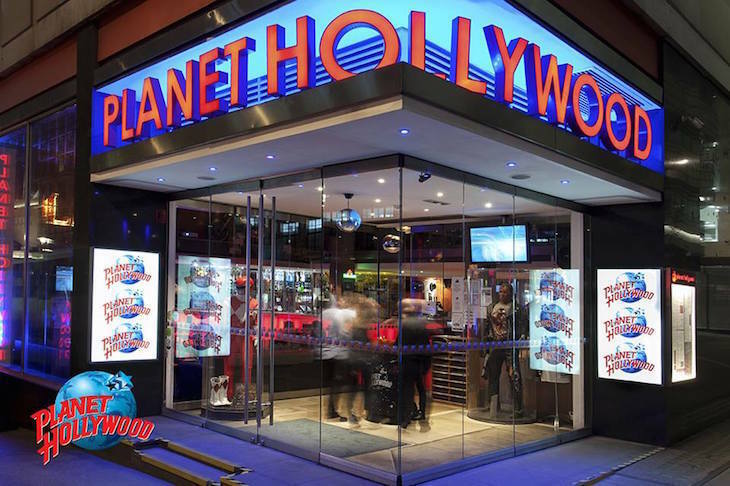 Buffalo wings, mini burger sliders, BBQ pork ribs, fajitas and strawberry cheesecake all feature on the Super Bowl 53 set menu at Planet Hollywood, which costs £35 per person and reserves your table for the entire game. Otherwise, watch it in the bar — entry includes a free drink, and for an extra charge you can order food from the bar bite menu all night. £35 per person for the meal/£15 entry to watch in the bar, book ahead, from 10pm. 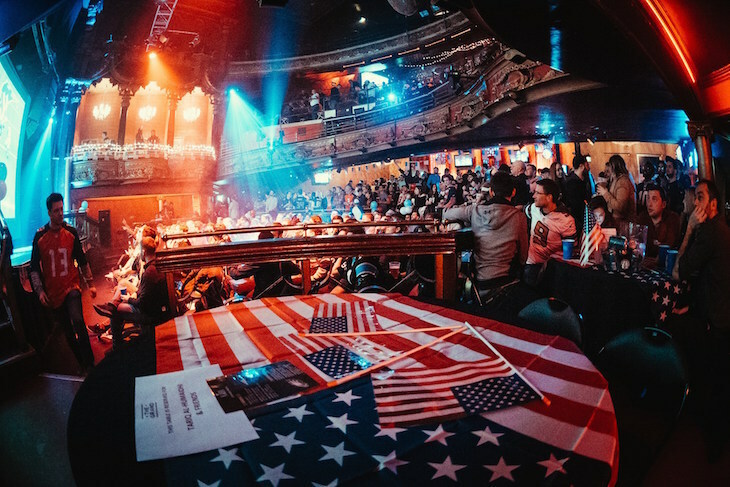 Tropicana Beach Club promises pre-show entertainment, London Cheerleaders, giant screens and a thumping sound system as part of an all-American party night. Standard entry is £15, or pay an extra tenner for a beer and hot dog too. Seating is not reserved. A mega screen and two giant projectors show the action at this Shoreditch pub, which specialises in craft beers served up in steins. Your ticket only guarantees entry before 9pm, and seating is unreserved. £10, book ahead, from 7pm. 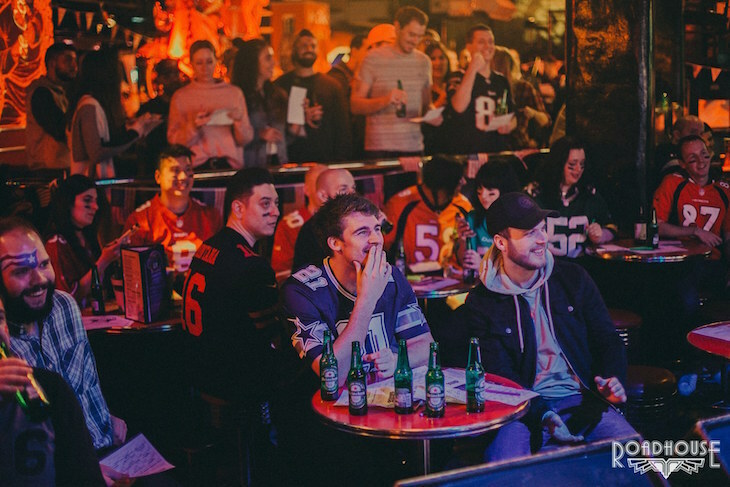 This east London boozer is having an all-American lock-in, with special Super Bowl food and drink promotions, pre-game entertainment and prizes for the best dressed (think red, white and blue to the extreme). Tickets include a drink and bag of popcorn. Sister venue of The Leyton Star (above), the deal is much the same at The Star of Bethnal Green — red, white and blue theme, food and drinks deals all night, and a free drink and bag of popcorn with your ticket. This upmarket City of London sports lounge shows the action across seven screens, kicking things off with some pre-game cheerleading. Your ticket guarantees you entry to the venue, but not a seat, so get there early if you want to watch in comfort.